Dallas’s 5th annual Rocks Digital Marketing Conference was a spectacular 3-day celebration to honor Social Media Day and the 1st annual Local Search Day. This event held in Addison, Texas is organized by Lissa Duty and Bernadette Coleman. Attendees included business owners, digital marketing agencies and enterprise level service providers. Click here to meet all the Rocks Digital 2016 speakers. Click here to access the LIVE blogs. 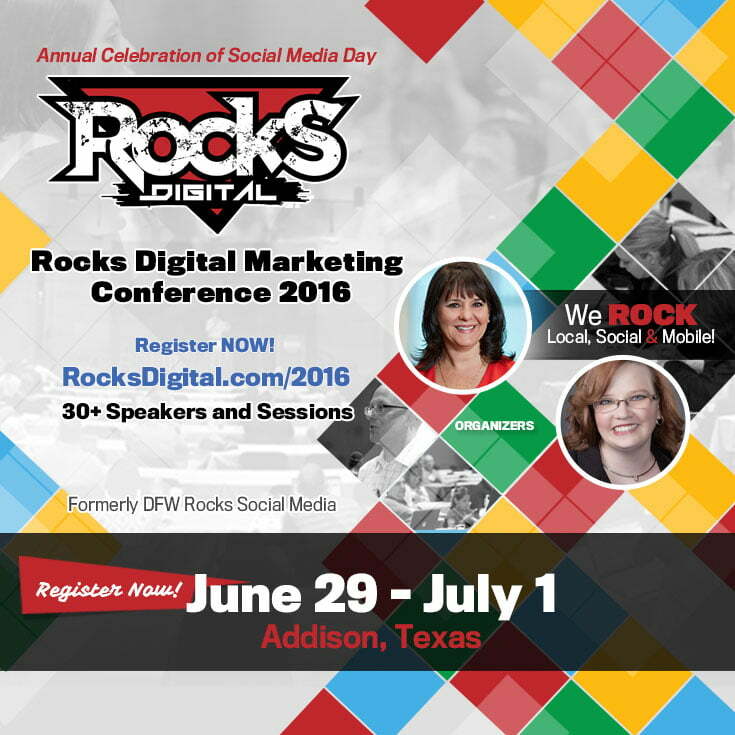 Click here to tour the photo highlights from the 2016 Rocks Digital Marketing Conference. Click here for full speaker bios and workshop descriptions. Click here for the full speaker bios and presentation descriptions. The Break-Out Sessions were divided into tracks by topic. The Emcee for this track was Mitch Todd, co-founder and co-organizer of Podcast Movement, and the speakers were Randy Krum, founder and president of InfoNewt, and Neil Lemons who is the founder of ILiveInDallas.com. This track also included a panel discussion on Podcasting. The panelists included Erin Smith of The Starters Club, Gary Leland from Podcast Movement, and Caz Gaddis from Self Crafted Media. Click here for full speaker bios and presentation descriptions. This track also included a return of the popular Geek Chat session, which included the following techy and self-professed geeks: John Nosal of NosalCentral, Robin Moss of ribit and Jeff Whitfield from Soulcraft Group. Once again the conference included a Q & A Session for all attendees to participate in, moderated by Lissa Duty. The panel featured: DeAndre UpShaw from Standing Dog, Bill Hartzer, and Heather Steele from Blue Steele Solutions. We closed out the day on June 30th with the Social Media Day Tweetup sponsored by Spyfu and a VIP concert with Sir Earl Toon of Kool & the Gang. Special thank you to our sponsors Spyfu and Advice Local for both of these exciting after-events. You can check out all the fun everyone had while getting important information about Digital Marketing over the 3-day conference by reading the LIVE blogs, touring the photo gallery and reading up on all the speakers that were in attendance. Haven’t attended before? Now is the time, mark the dates on your calendar and register.